Cheryl Hall joined our team in September of 2014. Cheryl is actively involved with Northeast Arc and received employment training from the Supported Employment program before obtaining her job at the Law Office of Julie Low. Through this program at the Northeast Arc, Cheryl was able to gain the skills needed to work in an office setting. Since starting at the law office, she has learned more about the field and is able to assist the staff with various scanning jobs, redacting, filing, copying, and cleaning. When Cheryl arrives at work her attitude is always positive and she has a smile on her face. She truly enjoys her job and her co-workers. 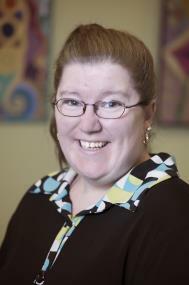 Cheryl currently resides in Peabody with her parents and her two dogs, Brady and Shamus. She is also an avid Patriots fan and loves to keep busy with her crossword puzzles and coloring books. If you are interested in learning more about hiring a Northeast Arc client, please contact Lauren Kreamer via phone at 978-624-3061, via email at lkreamer@ne-arc.org or at their website, Northeast Arc Employment Service.